Like most bloggers I read I am obsessed with candles, and, in particular, Yankee Candles and tea lights. When I moved to Somerset I was afraid that I wouldn't be able to find a stockist of my beloved Yankee Candles because Yeovil's quite the small town, however, much to my delight, there in a concession in Beales, sat a massive wall of Yankee Candles for my delectation! In the past I've only ever really used the Yankee Samplers because I can be quite picky with what I like and how often I want to change the scent of a room. The samplers were therefore best for me because they were quite small but still had the power to emit amazing aromas in my bedroom. Back in April I wanted to splash out on a big jar candle and combined my love of chocolate and bunny rabbits and bought Chocolate Bunnies. Now, 6 months later, my beloved bunnies have run out and I needed something else to keep my living room and kitchen smelling delicious. I decided to go for a wax tart burner, a design that's new for the festive 2013 period and four wax tarts to start me off. 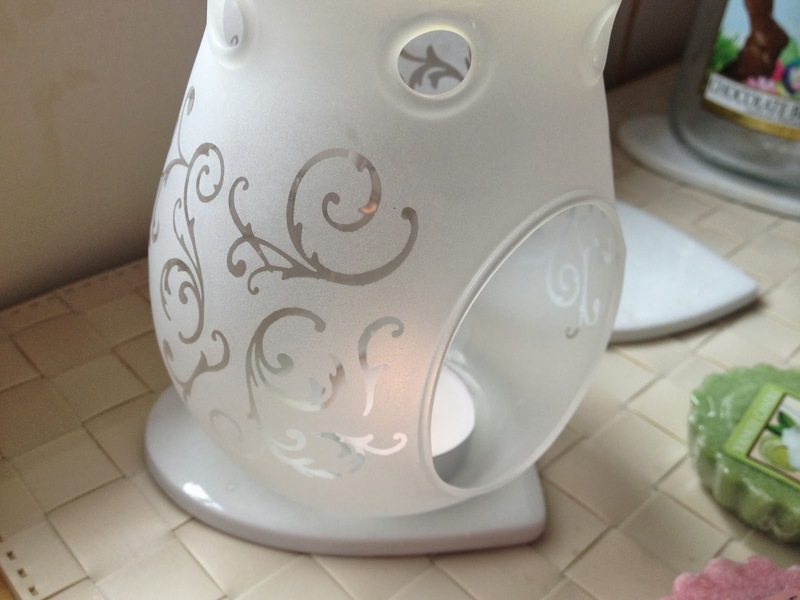 I chose the Florentine Frosted Glass Wax Burner and bought it for the RRP of £12.99. I was drawn to the pretty elegance of this particular design, how it fits in with my current decor and how it added a touch more class with the frosted glass and swirl patterns in comparison to the plain colours of the other burners I could see on the shelves. I love the simplicity of wax burners. You light and unscented tea light and slide it into the bottom of the burner, place a wax tart in the top section and it will slowly burn and melt, releasing which ever scent you've chosen as it does so. I've currently got the aromas of Christmas cookies filling my living room (I know, so premature!) and it's divine! The tarts themselves are not that expensive, about £1-£2 where ever you choose to get them from which makes them great if you're someone like me who doesn't like to stick to the same thing all of the time. I'm excited to start burning Snowflake Cookie, Summer Scoop and Vanilla Lime in the near future, but that may be a long way off yet considering how well Christmas Cookie is lasting! Fragranced candles are a much nicer alternative to deodorising sprays or those smelly chemical things you plug in to the wall in my opinion. Candles make me feel so relaxed and add a little something extra to a room...perfect for the forthcoming winter nights. Are you a candle fan? If so what are your favourite kinds of scents to burn? If you'd like to wish my blog a happy 2nd birthday come and enter my gift card giveaway. 1 x £10 for Boots and 1 x £10 for Topshop up for grabs HERE! I love Yankee Candles so much! I'm burning Blissful Autumn at the moment and it is divine! Will be so sad when it runs out! That burner is really pretty though so might see if I can get my hands on one! 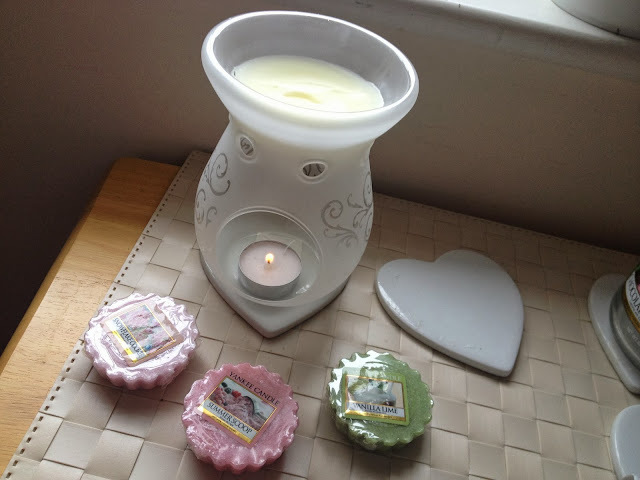 I love yankee candles and it was about last year I was first introduced to the wax tarts and they are amazing! I literally buy everyone a burner and some tarts as gifts! Im supppper excited to get y hans on some of the new christmas scents too! I love Yankee Candle - perfect way to make your home smell absolutely amazing! Your tart burner looks so beautiful! I love burning the wax tarts! I really wanted to stock up on the Autumn/Winter scents. 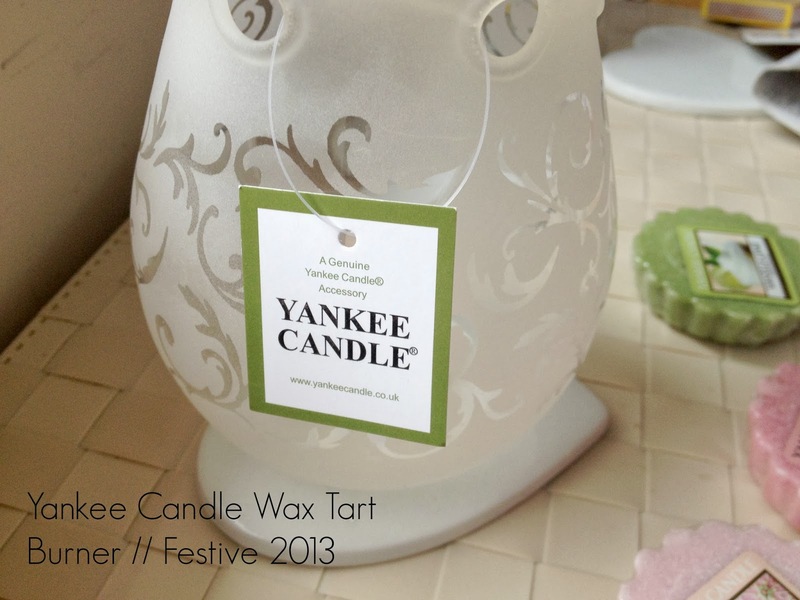 I'm currently running a Yankee Candle wax tart giveaway over on my blog if your interested?